Can we STOP already with all the claims that putting a fat body in a bikini is empowering? How about lifting something heavy off the floor instead? If it’s true that for many overweight women wearing a bikini for the first time in public is empowering, then whom are we to argue against this? However, I see something more going on here. That the plus size woman feels empowered on a beach in a bikini for the first time strongly indicates that they are used to VERY LOW STANDARDS of empowerment. It’s like saying that dog food tastes great because it’s better than cardboard. Cardboard is a pretty low standard for what a delicious food should be, don’t you think? It’s the same principle with this wear-a-bikini fad. First off, wearing a bikini to the beach or local swimming pool is no great feat. Isn’t that what bikinis are for? Wearing a two-piece for comfort and because you like the design is one thing. But can’t you think of more significant ways to boost your self-confidence than to wear what people have been wearing to beaches for a hundred years? If it’s about fashion, do the bikini. If it’s about empowerment and confidence, do the deadlift. If an overweight woman wants to feel empowered, she should take up strength training. And I don’t mean the strength training that she may already be doing: lightweight routines that include little dumbbells. Nothing empowers a woman more than the ability to pick heavy things off the ground! 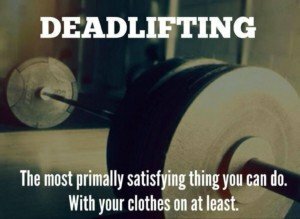 You can start training in the deadlift right away. • There is no emotional preparation involved. • No inner demons to battle or worrying what others will think. • You just do it. And it’s done. Just like that. No stress. No anxiety. You simply pick the barbell off the floor. Success! You’re on your way to TRUE empowerment. There is NOTHING wrong with feeling embarrassed or “ashamed” to wear a bikini in public. Gee, you’re human, after all. Worry more if you find that you have difficulty lifting weighty items — because every woman, EVERY BODY, should be strong. Nowhere is it engraved in gold that women aren’t allowed to lift up heavy things and that only men should be able to do this. The more efficient you are at hoisting heavy things off the ground and especially lifting them over your head, the less likely you’ll need to depend on people to take care of you in older age. You should feel more empowered – WAY more empowered – by honestly answering “No thank you” to the store clerk who asks if you need help carrying your packages to your car, than you should by simply wearing a bikini to the beach. Women who can do heavy deadlifts can lift weighty objects in daily life with ease. • They don’t become exhausted from housework or carrying toddlers. • They don’t need to wait for a man to come around to lift and carry things. How great is THAT? Talk about empowerment!!! Can wearing a bikini accomplish any of the above? Big deal, you took a selfie in your bikini and posted it to social media. You and hundreds, maybe thousands, of others have done the same. So what. No plus size woman will ever go down in history just because she posed in a bikini. If you want to overcome insecurities for REAL, then start deadlifting. If you want to prove something to yourself (and everyone else if that’s the case), then train your body to lift heavy things. Being trained in a heavy deadlift has major, major carryover to the tasks of daily living! It’s not just a show move. The deadlift works most of your muscles and joints in a single move: tremendous bang for your buck. Mastering the form and technique are crucial before advancing to heavier weights, but with focus and commitment, you can learn to pick up a very heavy barbell off the floor – even if you’ve been struggling for years with body shame, body hate and body image issues. The barbell does NOT care how much shame your body has endured. It just wants you to pick it up! If you’re fat and self-conscious, forget the doggone bikini and start deadlifting! It’s time to ditch the bikini for a barbell for empowerment. Here is how to safely perform the deadlift for beginners.